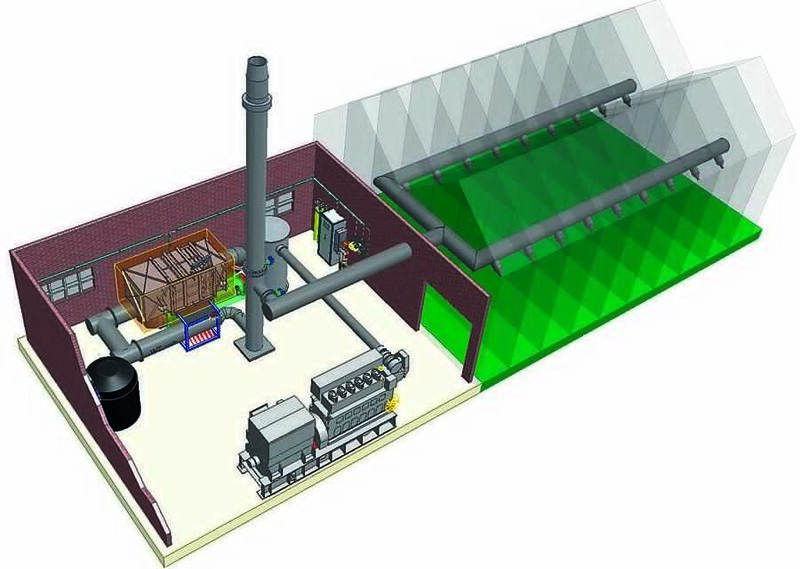 A CHP generator set is constructed from a power generator set with an added heat recovery module. 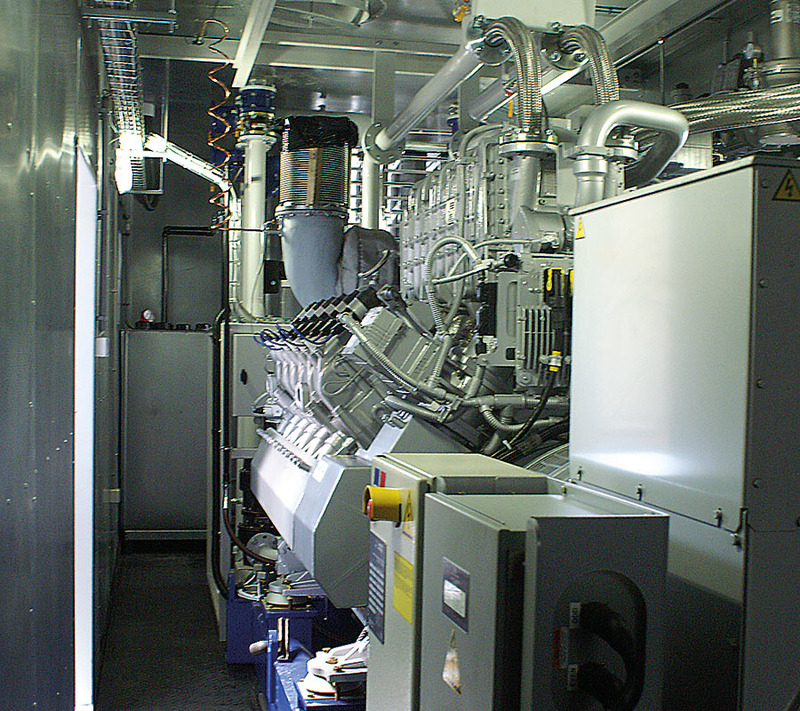 The scope of power of offered CHP generator sets: 8 kWe and 10 kWt to 2.2 MWe and 2.5 MWt. 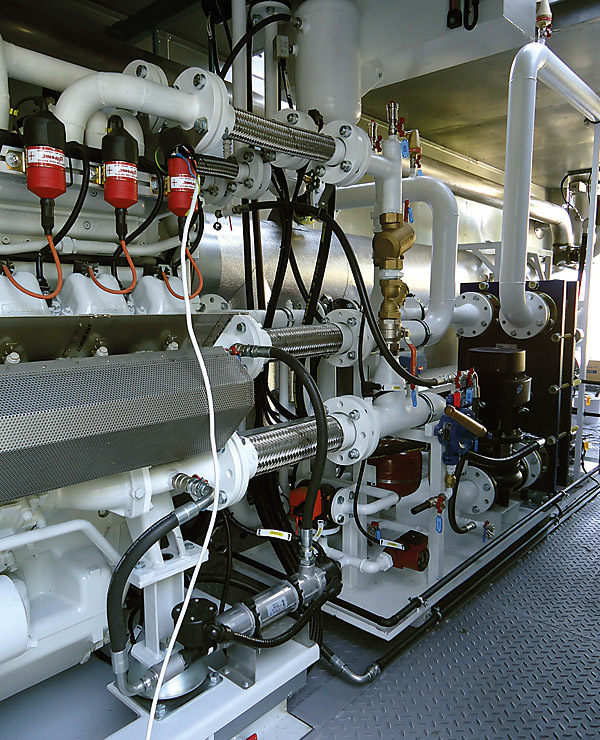 Complete systems may consist of up to 32 CHP generator sets operating for one power grid and one hot water collector. The estimated total operation time of the system is 120,000 hours. The amount of unit investment expenditures mostly depends on the power of the system and the composition and cleanliness of the fuel and the methods of transferring the heat power. 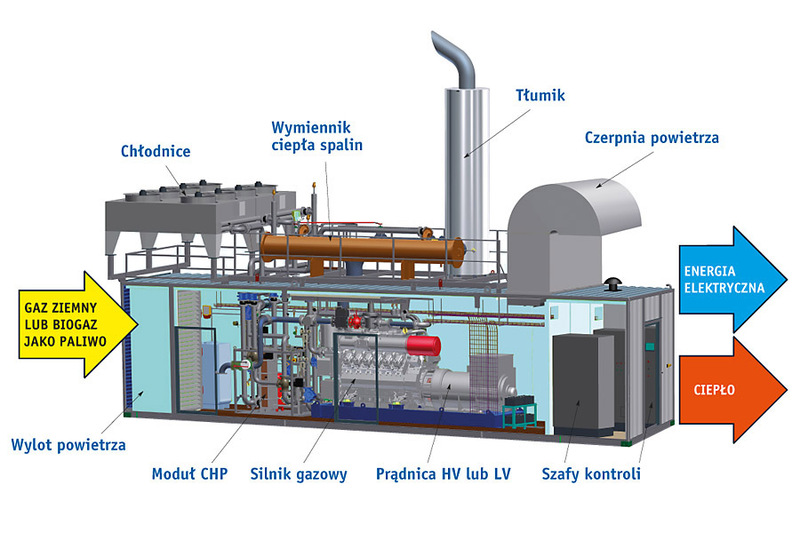 Potential applications of a CHP system: any place with a simultaneous demand for electric power and heat. it involves simultaneous generation of electric power and heat. 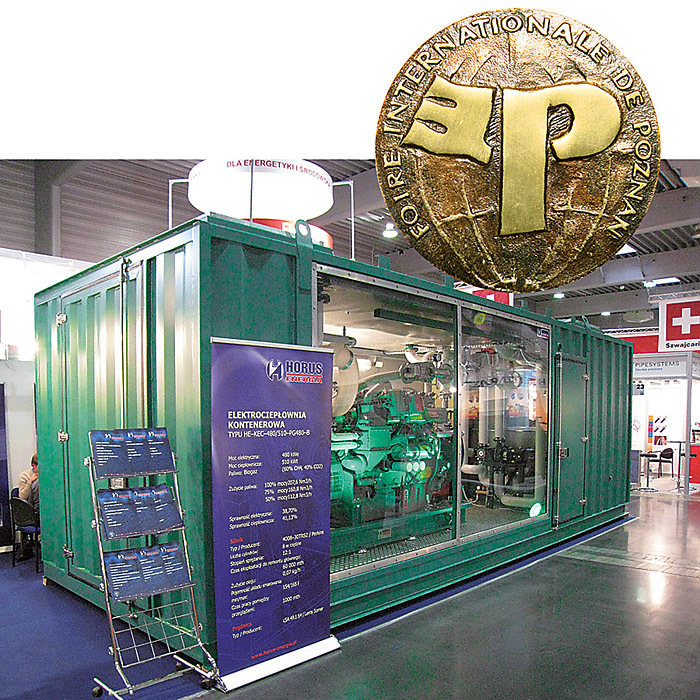 Our company offers systems powered by gas fuels, diesel fuelor vegetable oil . The main elements of our power installations include: gas or Diesel combustion engine, power generator, heat exchanger system and automatic regulation and control system. Electric power is generated by generator driven by internal combustion engine. 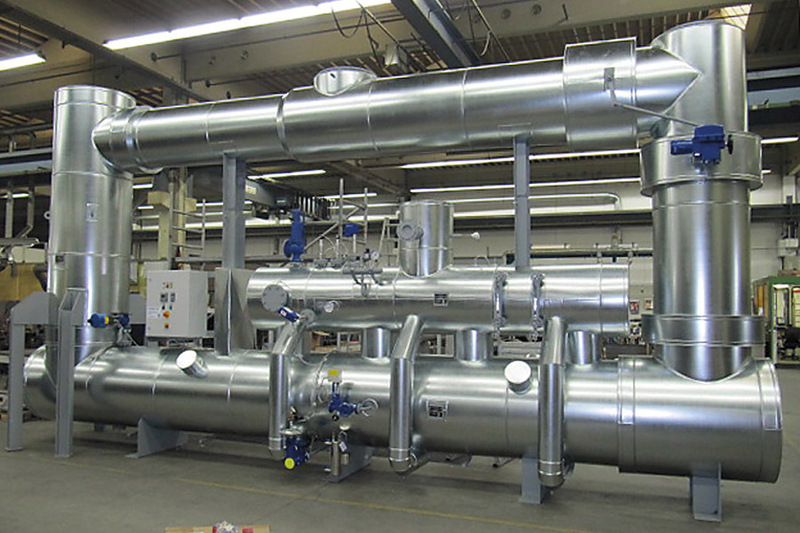 Combustion engines, on the basis of which our installations are built, are characterised by an efficiency of transforming the energy contained in the fuel into mechanical energy by a few percentage points, as compared to gas or steam turbines. Further on, in the generator, mechanical energy is transformed into electrical energy. For example, the efficiency of a combustion engine ranges from 37% to over 41%, while the efficiency of gas turbines does not exceed 35%. The rated power of the combustion engine, as compared to a gas turbine, is definitely less sensitive to ambient temperature changes. High operating flexibility, i.e. our systems can work at variable loads ranging from 60 to 100%, with a reduction in the electrical efficiency only by 1 to 2% percentage points. It should be emphasised that heat delivered by our systems is “for free”. This means that an appropriate amount of fuel must be provided to the engine to obtain a specific amount of electrical energy. Heat in the engine is generated, regardless of the fact whether it is recovered and used or released and dispersed. For example, under normal conditions, an engine, while generating 100 kW of mechanical power on a flywheel, also generates approx. 150 kW of heat power, out of which approx. 130 kW can be used. 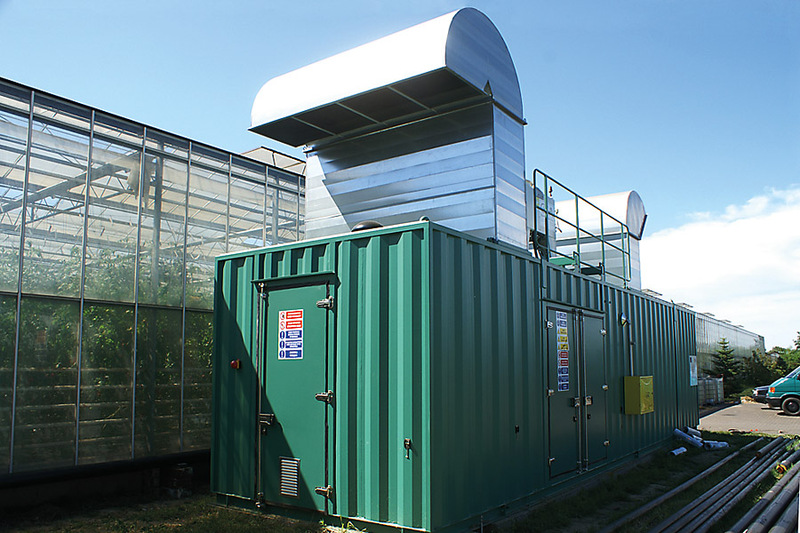 Our systems allow to recover the generated heat and used it without increasing fuel consumption in any way. 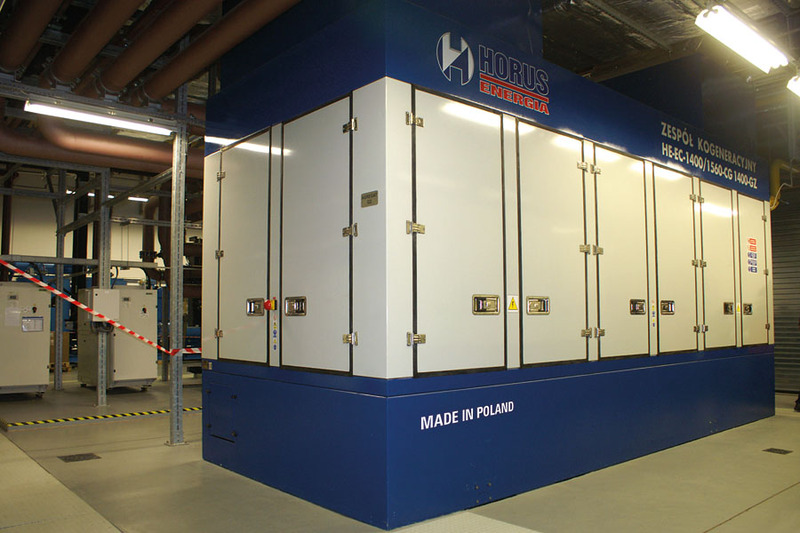 In a very wide spectrum of applications for CHP generator sets, there appears a group of clients who, apart from heat and electric power, also need energy transferred via other carriers or other products. These media can be generated during the operation of the CHP module. Appropriate modification or extension of the CHP generator set allows improving the degree of efficiency of the installation. In our climate zone, the demand for heat for heating purposes (e.g. heating of buildings) is present for approx. six months. In the remaining period, only warm tap water is needed. A perfect solution, allowing to avoid the necessity of dissipating heat during operation of the set into the atmosphere, is the application of absorption chiller or ADsorption chillers. 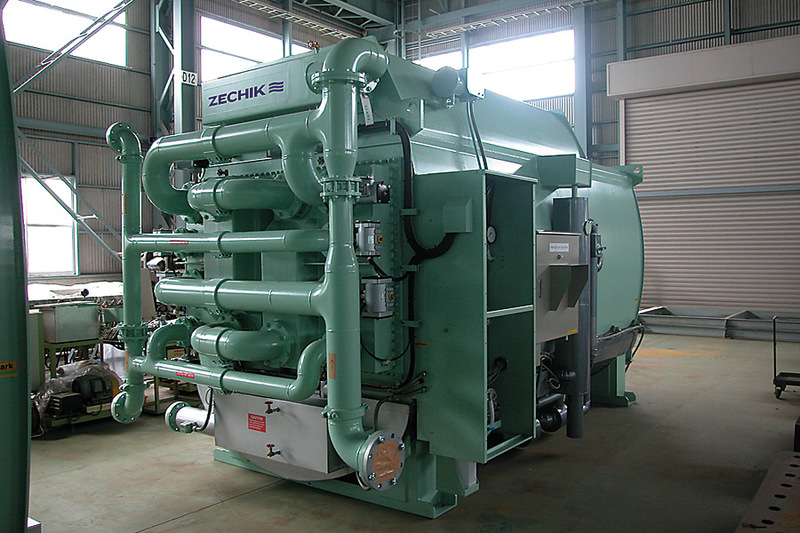 By means of these devices, using heat collected from operating CHP generator set, chilled water can be produced. Adsorption chiller, a sample product from the offer of the company Zechik Sp. z o.o.